Looking to get fit in the comfort of your own home, without having to buy a gym membership or expensive equipment? The good news is, you don’t need a top-of-the-line treadmill or thighmaster to reach your fitness goals (even if those late-night infomercials suggest otherwise). Aside from using your own bodyweight to get fit (which works fabulously, by the way), According To thehomedigs.com here are some must-have pieces of home gym equipment that can take your workouts to the next level — without breaking the bank. Forget clunky, overpriced treadmills that end up gathering dust (and taking up space) in your spare room or basement. 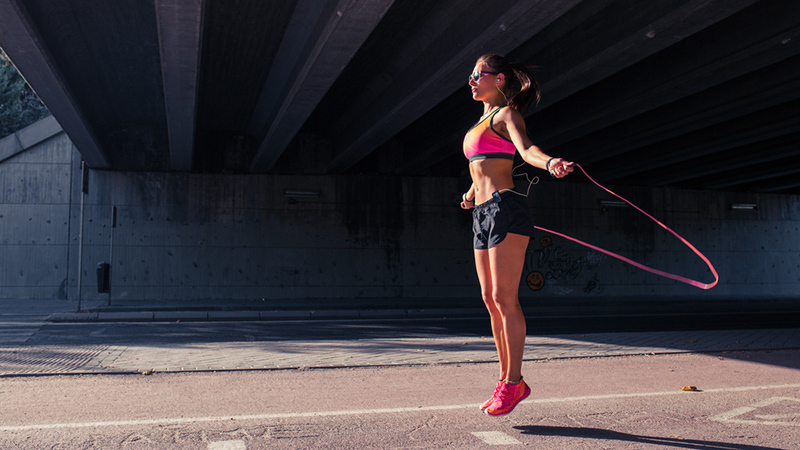 When it comes to cardiovascular exercise, a jump rope is invaluable. A high-intensity movement, jumping rope will get your heart rate up, torch fat and burn calories at a faster rate than steady-state jogging on a treadmill ever could. Not only is jumping rope an excellent cardio exercise, but it also utilizes all your major muscle groups (especially your powerful legs and glutes), while also improving balance and footwork. As a bonus, a jump rope is lightweight and easily portable, meaning you can fit it in your suitcase when you travel or take it to the park for an outdoor workout. Incorporate these into your existing fitness routine, or try a total-body medicine ball sculpting routine. Want to up the ante? Make your medicine ball workout HIIT style! Lighter and larger than medicine balls, stability balls are amazing for building strength and balance exercises. Compared to using just bodyweight alone, stability balls force your muscles to work harder as they maintain balance, which means a more effective workout. Incorporate any of these moves into your existing at-home workout or try this short stability ball routine to work your arms, abs and glutes. This is another piece of equipment with a huge range of possibilities. As with many other pieces on this list, kettlebells are wonderful for performing compound, strength-based exercises that target more than one muscle group at once. That means you’ll improve your functional fitness, while also getting a cardio boost as well. If you really want a tough workout, give one of these HIIT-style kettlebell routines a go. Too intense for your taste? Try this full-body routine, which combines yoga and kettlebells for both strength-training, lengthening and stretching. Resistance bands or tubes are fantastic for adding some resistance to your existing workout routine. They’re cheap, take up hardly any space, and can be used for virtually any muscle group. If you’re looking for an all-in-one workout that combines cardio and strength-training, we’ve got you covered with this resistance band routine. Looking to tone up your tush? Resistance bands are great for that, too. Whether you’re a weight-lifting beginner or you’re looking to build some serious muscle, dumbbell workouts are virtually endless. Sculpt your arms, your back, your abs, and your whole body by adding dumbbells to your routine. If you’re looking for a challenge, one of the easiest ways to increase the intensity of a bodyweight workout is by simply strapping on some ankle weights. You’ll sculpt your legs, glutes and abs like never before, especially if you’re running, walking or climbing stairs. Get started with this five-move ankle-weight routine, which will no doubt test you in newfound ways. With these exercises, you’re well on your way to sculpting your legs, glutes and abs like never before. To up the ante, try completing the circuit twice for a 10-minute workout. Foam rollers have long been popular within the realm of physical therapy, and with good reason — these lightweight tools can help release tenderness in muscles and connective tissue, aid stretching and prevent or gently treating injuries. Nowadays, gym-goers capitalize on their ability to strengthen the core and other large muscle groups while also releasing those tight, tense “trigger points.” Learn more about foam rolling here, and try some of these foam rolling moves after a workout to prevent soreness. Last, but not least — the exercise mat. If you’re going to invest in just one piece of gym equipment, let it be a high-quality, breathable exercise mat to use for use for all of your workouts. Aside from crunches, core work and knee push-ups, you’ll want a nice mat for stretching and cooling down post-workout or for performing some gentle yoga movements.